That India is a personality driven market is well-known. Earlier this month, the return of N. R. Narayana Murthy to the leadership of Infosys along with his son only emphasised this fact. Recent events around the spot fixing scandal beginning with the arrest of S Sreesanth and two other cricketers, the turmoil around the stepping aside of N. Srinivasan from BCCI after the arrest of his son-in-law, the questioning and suspension of Raj Kundra, co-owner of Rajasthan Royals; and the firing of Phaneesh Murthy from tech firm iGate (and the class action suit filed against iGate) reveals the PR challenges for brands when individual behaviour comes into play in a personality driven culture. Separating individual behaviour from their brands: How did iGate and IPL behave? Adds Mantri, “In my view, the IPL scandal spread faster than the authorities could have anticipated or put a check on it. But still I think given the amount of stakeholders involved in this premium tournament, the crisis could have been handled well as the International audience, players, media and public at large saw the IPL brand take a huge hit. There was a lack of decisive action and also many voices saying different messages." BCCI's initial poor response to the scandal escalated the issue, peaking with the public spectacle of N Srinivasan’s refusal to quit, made it a running lead story with television, print media and social media. Even the recent “ Operation Clean Up” by BCCI, though a first step in declaring a plan to address issues, has been criticised for not addressing key issues such as strategic time outs and the more fundamental issue of a transparent look into the financial backgrounds of BCCI members. In a situation, where media interest is very high in a story, brands need to put in speedy monitoring tools to assess who the key influencers are, what the sentiment is and which channels the talk is coming from. Liz Hardy, Marketing Executive of Odimax Limited, says “When a crisis hits a brand, it can be tempting to go into social lockdown, keeping communications to a minimum and hoping that the storm will blow over. However, in the social media world, bad news travels fast, and ignoring a spell of bad press is likely to exacerbate the problem, rather than make it go away." Odimax, which also works with agencies such as Perfect Relations, uses a crisis Monitoring and Management facility to alert users of an arising crisis at the earliest possible opportunity. A quick look at the way social media reacted to the IPL crisis, in the last few days of May shows a tag cloud offering quick cues into what matters within IPL. This shows Srinivasan emerging( at the peak of his stepping aside drama) as the biggest talking points with fans as one of the smallest talking points. It’s interesting that one of the biggest stakeholders for IPL, the cricket fan, does not figure as a major talking point. 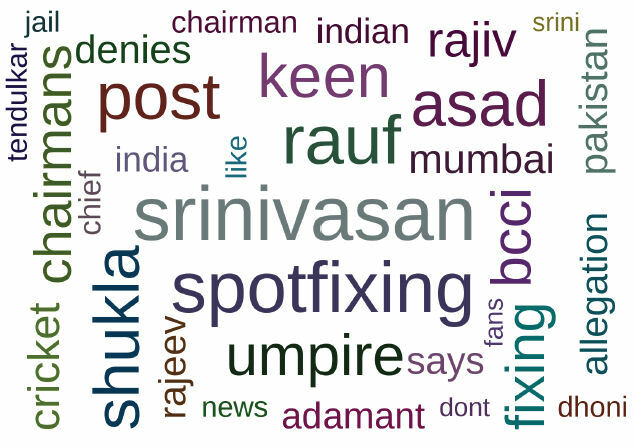 A look at the main influencers for IPL around the spot fixing sandal on social media demonstrates that traditional media still dominates as a top influencer, with NDTV topping the list of influencers, with newspapers and magazines, such as Hindustan Times, Indian Express, India Today and DNA making up the rest of the top five list. 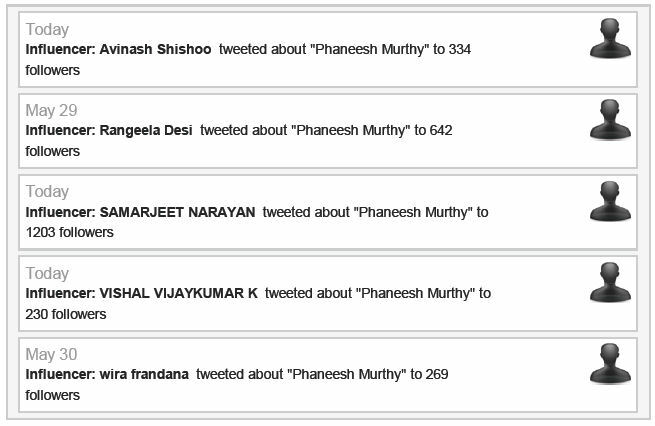 Where Phaneesh Murthy is concerned, interestingly the top influencers were individuals and not media organisations. Once the listening tools are in place, experts recommend several quick steps in managing the crisis. In the wake of both the iGate and IPL crisis, neither brand has offered a strong apology to the stakeholders. iGate for example, has not clarified its judgement in choosing to hire a person with a chequered personal history to lead a million dollar business. While BCCI has taken initial steps by announcing “Operation Clean-up”, it has been slammed by critics as a slow and very small first step.